Happy Monday! Back at work again after a short weekend. I didn't find any shoes that fit LO properly this weekend, except for a pair of shoes that were a size too large. Lucky for her she can kick them off easily. She'll grow into them, but in the meantime, the search continues. I did manage to find a pair of elusive Zara Vamp flats in black at the local Zara though - I gave up the search when I saw they were sold out online and didn't expect to find any in store, but I lucked out and got their last pair in my size. Score! I started today's mani with Zoya Natty, a greyed out dark blue cream from Zoya's Fall 2012 Designer collection. True to Zoya's impeccable formula, it applied super easily in two coats. It had tons of shine on its own so I didn't use any topcoat in these pics. Next, I used a layer of Sweet Color Dazzling Magical Shade 1 from the born pretty store over Natty. Sweet Color is a line that is exclusive to born pretty and comes in several finishes and colors. 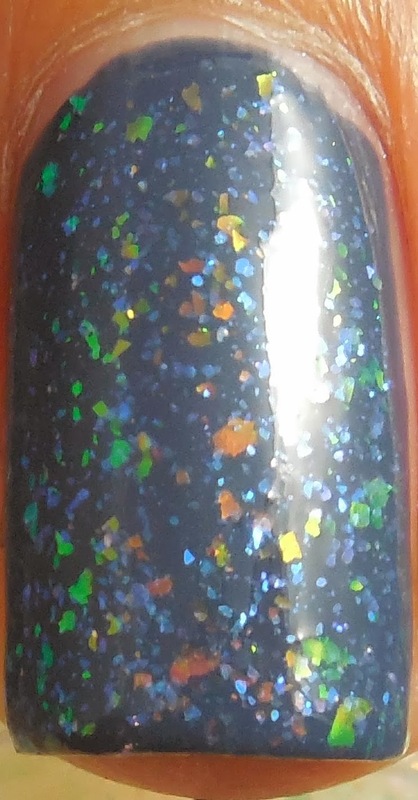 This particular line is called "Dazzing Magical Multicolored Shell Glitter" and comes in 11 different shades, with or without black base coat for $8.99. I'm a sucker for flakies so of course I had to pick one of these up, starting with #1. This particular flakie has a clear base and the flakies reflect blue, purple, and some green. I thought Zoya Natty would show off these shades the best. Formula was easy to control and I didn't have any errant flakes sticking out. Isn't that flakie super pretty? I'm impressed with the application and smooth finish of this Sweet Color line and I'm definitely looking forward to picking up some more flakies from this line. There are some really interesting shades and I'm curious to see their finishes. Born pretty store often has discounts and sales, so keep an eye out for it or use my code(yes, they found me and gave me a code) BAWQ10 to get 10% off your purchase. Have you fallen for any flakies lately? Or shoes for that matter? Gorgeous combo! Those flakies are super pretty over Natty.